This low mileage Mini One 1.2 has covered just 15578 miles since March 2016 and has a service history by Mini dealership and ourselves. It is powered by an economical 1.2 petrol engine, which is in CO2 Band B, with 192 BHP and a combined MPG of 61.4. 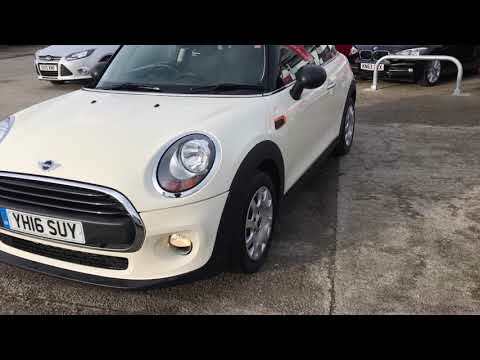 This Mini is finished in white with silver wheel trims, front and rear parking sensors, a black grill, and chrome exterior styling. The interior has cloth seat upholstery, Bluetooth connection, DAB radio, aux and USB connections, and 6-speed manual transmission. Join us for a test drive at Evesham Car Sales, WR11 2FP. Before delivery, this car will have undergone our extensive pre-delivery inspection covering all mechanical and cosmetic aspects of the car. All our cars come with a complimentary 3-month warranty which is extendable, fresh oil and filter change and a minimum of 6 months MOT and service if required. All our customers benefit from our Pershore Motor Group Reward’s Club which gives you FREE MOTs for life, 6 free wash and vacs by our professional team of valeters per year, £250 off your next car purchase with us at any of our showrooms and a £100 refer a friend bonus scheme.